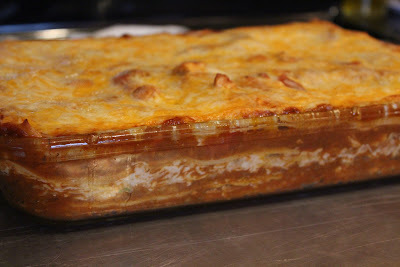 The other night I needed a super easy dinner and I was inspired by my friend Michelle’s recitation of her latest enchilada recipe that had chicken, chorizo sausage and a tomato base. She sent me the recipe, but naturally I didn’t have any of the ingredients on hand – when I do, I’ll make it and tell you about it cuz it looks amazing. 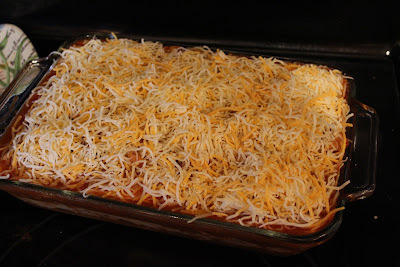 In the meantime, I was going for a PURE-LEFTOVERS enchilada hotdish. Last Sunday I made homemade flour tortillas, but those had hardened in the fridge and weren’t soft enough for tacos anymore. 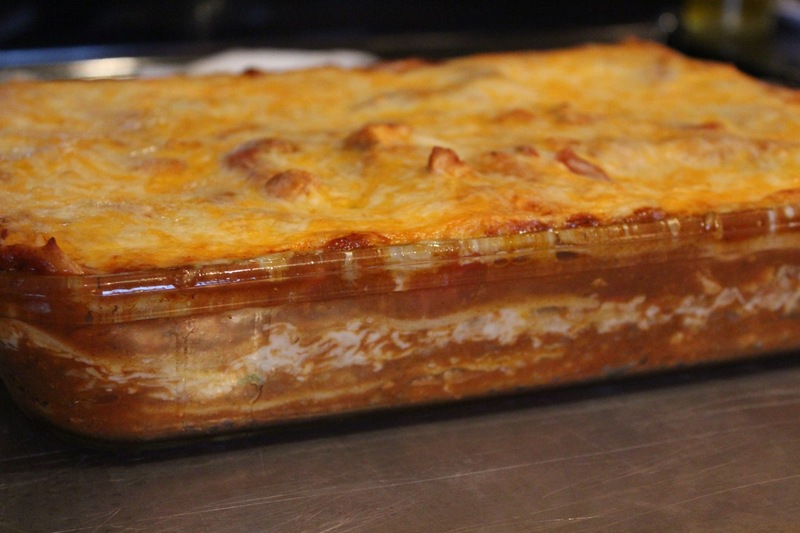 Perfect for layering as lasagna noodles, enchilada style, though! I always keep taco seasoning on hand, so no worries when we want easy Mexican. This is what I came up with - pretty, huh? Preheat your oven to 350 degrees. Spray a rectangular baking dish with cooking spray. 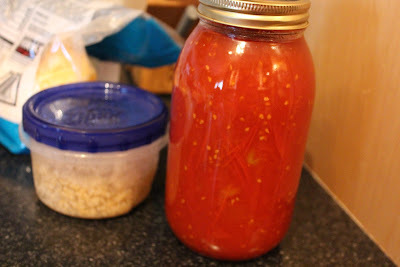 Bring the tomatoes, water and taco packet (the first one) to a boil on medium-high heat. 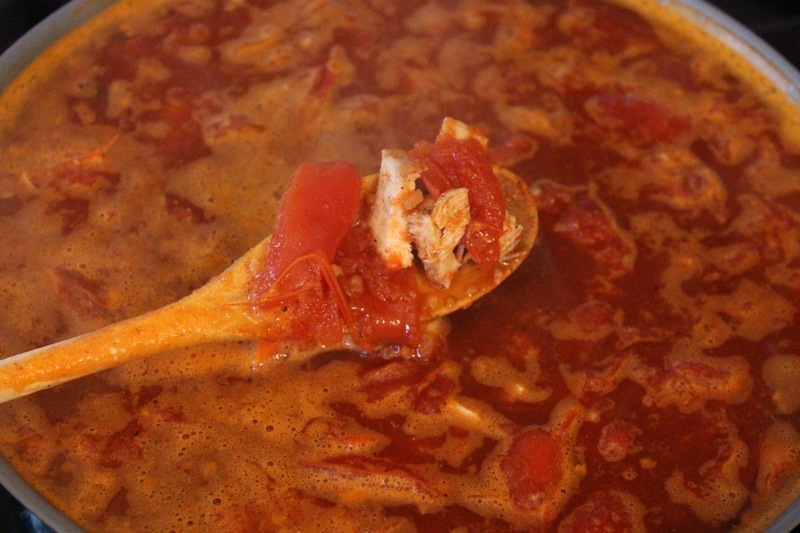 When it comes to a boil, turn it down to a low simmer for a few minutes, then taste it and see if you want to add more taco seasoning; if so, do it now. Then add the chicken and simmer for several more minutes. 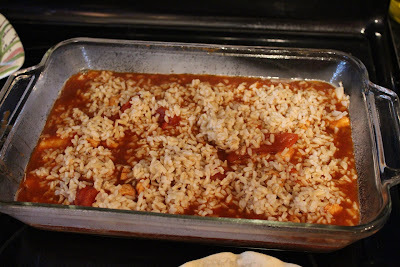 Whole pieces of tomato and bites of chicken, simmering away. While the chicken is simmering, slice the tortillas in half. My homemade tortillas are on the right. I used a few corn tortillas too. Spoon some of your enchilada sauce onto the bottom of the baking dish until the bottom is fully covered. 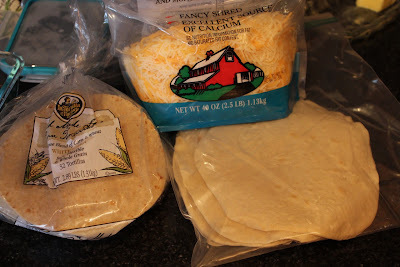 Lay the tortillas across the bottom until it is fully covered, no gaps. 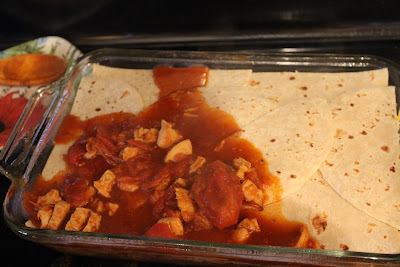 Cover with an ample layer of sauce (about half of it) and chicken and more tortillas, no gaps. Cover this next layer with the rice, spinach and half of the cheese. Now another layer of tortillas, no gaps. Now top with the remaining sauce and cheese. Bake for 30-40 minutes until it is all hot and bubbling. Yummy! The kids asked for seconds and that is RARE since they would rather do just about anything than take time out of their day to eat.